Nine days after Suleiman had written his victory letter in Belgrade, the man to whom it was addressed set foot in Rhodes. His name was Philippe Villiers de L’Isle Adam, a French aristocrat who had just been elected grand master of the Order of Saint John. He was fifty-seven years old, the descendant of a family with a long history of dying for the Crusades. His ancestor had conducted the order’s last-ditch defense at Acre in 1291. L’Isle Adam must have been under few illusions about the task ahead. The voyage from Marseilles to take up his post had been ominous with portents. Off Nice, one of his vessels caught fire; in the Malta Channel, the Order’s great flagship, the Saint Mary, was blasted by a lightning bolt. Nine men fell dead; a crackle of electricity flashed down the grand master’s sword, reducing it to twisted scrap, but he stepped away from the scorched deck unharmed. When the ships put in at Syracuse to repair the storm damage, they found themselves shadowed by the Turkish corsair Kurtoglu, cruising offshore with a powerful squadron of galleys stripped for war. Under cover of darkness, the knights quietly slipped from the harbor and outran their pursuers on a westerly wind. L’Isle Adam was well aware what was likely to unfold—the knights’ intelligence was excellent and they had been bracing themselves against attack for forty years. The early years of the sixteenth century ring with their appeals to the pope and the courts of Europe for men and money. After the Ottoman capture of Egypt in 1517, the menace of the Turk loomed larger than ever. The Christian sea began to tremble in dreadful anticipation. Pope Leo was almost paralyzed by fear: “Now that the Terrible Turk has Egypt and Alexandria and the whole of the Roman eastern empire in his power and has equipped a massive fleet in the Dardanelles, he will swallow not just Sicily and Italy but the whole world.” It was obvious that Rhodes was the front line in a gathering storm. The grand master renewed his appeals for help. The unified response of Christendom was exactly zero. Italy, as Suleiman well knew, was a battleground between the Hapsburg kings of Spain and the Valois of France; Venice, bloodied in her earlier struggle with the Turk, had opted for treaties of friendship; while Martin Luther’s reformation was beginning to split the Christian world into fractious shards. Successive popes unceasingly jabbed the conscience of the secular potentates of Europe to no avail, and dreamed up fantasy schemes for crusades. In more lucid moments the popes bewailed the disarray of Christendom. Only the knights themselves rallied from their command posts across Europe, but their numbers were pitifully small. Undeterred, L’Isle Adam began preparing for siege. He dispatched ships to Italy, Greece, and Crete to buy wheat and wine. He oversaw the clearing out of ditches and the repairing of bastions and the operation of gunpowder mills—and tried to stifle the hemorrhaging of information across the narrow straits to the sultan’s lands. In April 1522, the unripe wheat was harvested and the ground outside the town stripped of cover and scorched. A pair of massive iron chains was hauled across the harbor mouth. Four hundred fifty miles away in Istanbul, Suleiman was gathering a huge army and fitting out his fleet. The hallmark of any Ottoman campaign was the ability to mobilize men and resources on a scale that paralyzed their enemy’s powers of calculation. Chroniclers tended to double or triple the reasonable estimate of a force that could be assembled and supplied for war—or simply gave up; “numerous as the stars” was a common epithet of appalled defenders crouching behind their battlements at the sight of the vast host of men and animals and tents camped outside. In this spirit, the expedition to Rhodes was put at an inflated two hundred thousand men and a mighty armada of ships, “galleasses, galleys, pallandaries, fustes and brigantines to the number of 300 sails and more.” L’Isle Adam decided against counting his men too carefully. There were so few of them, it would be bad for morale, “and he feared that the Great Turk might have knowledge by goers and comers into Rhodes.” In all likelihood there were five hundred knights and fifteen hundred mercenaries and local Greeks to defend the town. The grand master decided on a series of morale-raising parades, whereby the various companies “decked their men with colours and devices” and mustered “with the great noise of trumpets and drums.” The knights in their red surcoats bearing white crosses made a cheerful array. 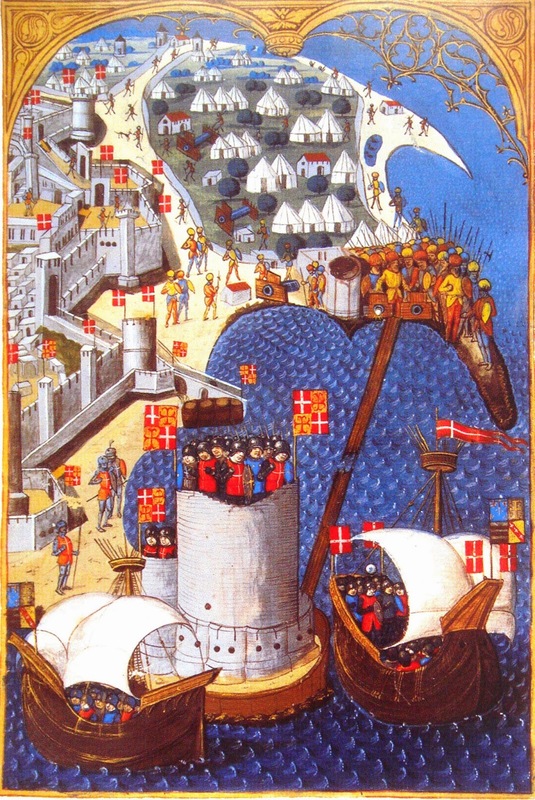 When Mehmet had besieged Rhodes in 1480, he had not attended in person. He stayed in Istanbul and sent his commander. Suleiman resolved to make a personal call on “the damnable workers of wickedness.” Any sultan’s presence upped the stakes in a military campaign enormously. Defeat was inadmissible; failure by any corps commander meant dismissal—or death. Suleiman was coming only to win. On June 10 the knights received a second letter, this time stripped of diplomatic niceties: The Sultan Suleiman to Villiers de L’Isle Adam, Grand Master of Rhodes, to his Knights, and to the people at large. Your monstrous injuries against my most afflicted people have aroused my pity and indignation. I command you, therefore, instantly to surrender the island and fortress of Rhodes, and I give you my gracious permission to depart in safety with the most precious of your effects; or if you desire to remain under my government, I shall not require of you any tribute, or do anything in diminution of your liberties, or against your religion. If you are wise, you will prefer friendship and peace to cruel war. Since, if you are conquered, you will have to undergo all the miseries as are usually inflicted by those that are victorious, from which you will be protected neither by your own forces, nor by external aid, nor by the strength of your fortifications which I will overthrow to their foundations…. I swear this by the God of heaven, the Creator of the earth, by the four Evangelists, by the four thousand prophets, who have descended from heaven, chief amongst whom stands Muhammad, most worthy to be worshipped; by the shades of my grandfather and father, and by my own sacred, august and imperial head. The grand master did not deign a reply. He concentrated his efforts on the manufacture of gunpowder. On June 16 Suleiman crossed the Bosphorus with his army and proceeded to make his way down the Asian coast to the crossing place to Rhodes. Two days later the fleet set sail from its base at Gallipoli, carrying heavy guns, supplies, and more troops.